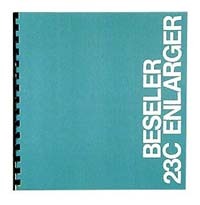 High quality copy of the original Beseler instruction manual for 23C Series II condenser enlargers as manufactured during the 1970's. This deluxe reproduction features a comb binding so it will lie flat for easy reference, front and back covers on heavy cover stock, and a clear plastic cover page for added protection and durability. 8½" x 9" format. Comb bound. 13 pages plus parts diagram. If your 23C enlarger has been fitted with a Dichroic colorhead, you will also require the separate colorhead manual. Note: During it's long production run, there have been numerous revisions to the 23C resulting in multiple versions of the instruction manual. Although basic operation of the 23C condenser enlarger has remained much the same, parts diagrams and parts lists differ between the versions. If you are unsure as to which manual to purchase, please click here to refer to our 23C Manuals Selection Chart.